"war... war never changes... but is the nuclear war that changes everything..."
"We don't know yet if it was because of some sort engine failure or an act of sabotage but the cargo crashed suddenly during the landing procedure. 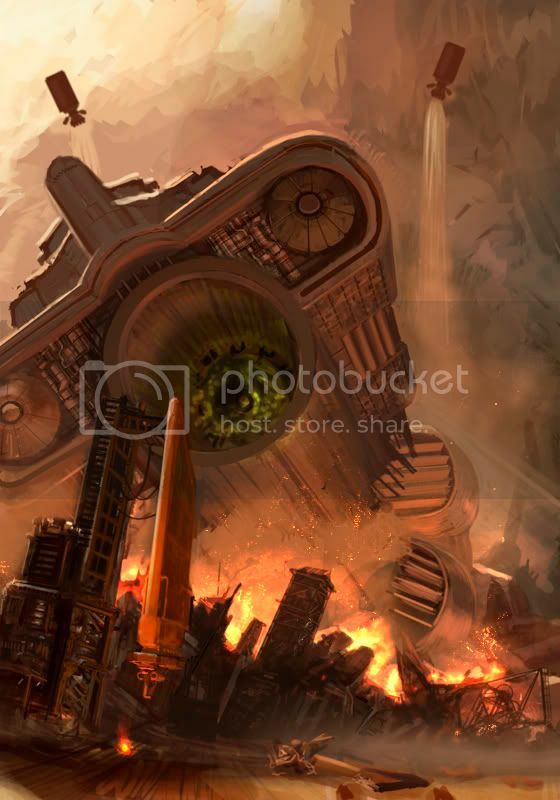 When it started to fall, nothing could prevent the destruction of all our facilities. For the moment let's concentrate in putting out the fire and finding the survivors!" Colonna's Founder, designed and built his shipyard just ten years after the War Between the States.Charles is working together with ShipyardXchange to establish integrated channels, with access to all of the 14 Kvaerner shipyards throughout the galaxy, to provide exchange and collaborative capabilities for all the suppliers in their network." "In fact, on December 7th, 1941 Japanese ships were attacked by American bombers, yeah, that's right. This absolutely rare (maybe it's the only one!) painting shows an accurate depiction of what really happened during the 2nd WW..."
"As the climate grew more radical and cities more self-sufficient (due in part to technology), the crude shipyards of the Great Bay fell as quickly as they arose--a growing trend of mankind's achievements." ""In times of peace, wise men prepare for war", and that's exactly what the we were doing. Pouring money into R&D, trying to find ever more efficient ways of destroying enemy life. The propeller-heads told us the 'seeds' were dorment... small, silent, perfect. Someone should have told the navy they don't remain so around moisture." "I'm like totally new here so I'll just jump right in." 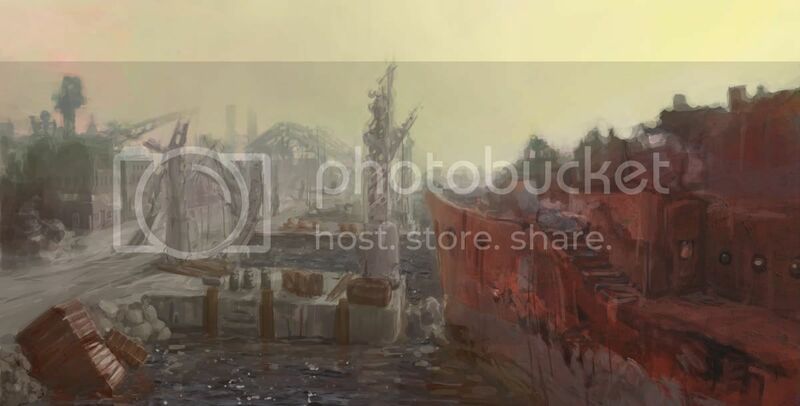 "An old shipyard in the morning." There is just the three of us now, My son , his old dog Pip and me. We lived on a lighthouse in the mid atlantic.The last manned lighthouse. I gave the boy as good a life anyone could give him under the circumstances.His mother dying giving birth to him and all. When we hadnt heard from the mainland , I wasnt too concerned at first, the storms had been bad this winter and sometimes the resupply boat is late.It was when the food ran out that I decided to head into shore. All we found was bones, bones and bodies everywhere.Human and bird bones.I had heard about this Bird Flu Virus but didnt think much of it at the time. Well anyway it looks like myself and the boy were spared, living so isolated as we did. Its been five years now. I go out everyday and fish for food, and the boy and Pip wait for my return on the old dock every evening.I keep telling him some day soon other survivors will turn up. I have to keep positive for his sake. "Fish is scarce in the future, people salvage what ever they can from the once great petroleum fueled cars to build hovering ships however the precious fish is guarded like gold in the seas. After the last remaining fishing ships were destroyed by a band of rival fishermen, 10 year old Markus Thomas signals help from the patroling rescue ships." Dominus : Nice pallet , but I feel it would be nice to see some more definition and detail. ferak seg : I like the lighting in this really cool. I think the structure in the left fore ground needs to be brought forward or the big space ship pushed back.Also the composition leads the eye to the bottom right, but there is no pay off. Stokes Awesome man, really cool, maybe a little to dark in the left foreground. Though subject wise it does not seem to meet the brief of a ruined shipyard. A very cool one, but not so much a ruined one. HideyoshiA nice piece, great dynamic and excitement. A cool movie concept piece. I think that maybe the foregroound buildiings need to be stronger as they have the same weight as the midground . Overall really cool. Johnnyhorse Nice pallet, would love to see it finished. I like the painterly style. EtaCarinae I like the postive and negative shapes in this, lighting is nice too. Would like to see it finished also. morsecode658 more depth and atmosphere needed I think.The levels are merging together too much. yAdam I really like your painterly style , very nice pallet. The foreground could do with a little more weight. Gaius Why didnt you finish this? If you had of added atmosphere and worked on the foreground elements and lighting a little more this might have passed for mediocre image.You need to try harder and stop playing games and work more. Evil Sloth I am a sucker for a Painterly style. I like the light from the lamp on the metal structure. Ok my vote goes to Hideyoshi for creating a exciting image and sticking to the brief. Stokes you were a close secound, but you werent close enough to the brief in my opinon. im torn between hideyoshi and strokes so im not going to vote. I always look for the unexpected artist to surprise me with something great and new. There were several great pieces this round, but Hideyoshi just floored me with the mood and action in his. I have to give him my vote, great job. Stokes, that is one fine sci-fi scene! Double thumbs up!!! Oof, tough round - finally gave in and voted Hideyoshi - love the comp. I voted stokes - just the most polished. Also loved ferak seg, Hideyoshi, and Gaius; some of who's paintings were more obviously wrecked shipyards. Awseome work guys. This week's was close. Stokes & yAdam's were the runner-ups. The others were good, but the majority of them were too action filled for that empty feeling a ruined shipyard has or had the use of warm colors. Personally, I see a ruined shipyard as a sibling of the ghost town setting. 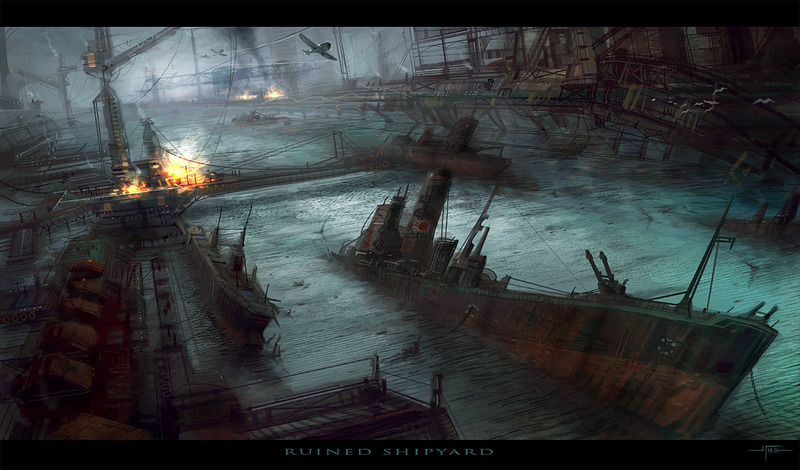 Plus, a ruined shipyard also has that romantic landscape feel/look, in my opinion. By romantic landscape I mean, the notion of the vastness of nature, or the reclamation of the natural world from man. yAdam was second for me and Dominus was my third. I like how stokes pieces evokes a great sense of mood and story. The piece is somehow mysterious and makes you want to know more about the story behind it. And it's also really well executed. So that's why he's got my vote. The other pieces were really well done as well, I just felt they lacked the mood compared to stokes piece. very cool stuff going on Vored for Ferak seg cause of the drama... Tghe image tells a story. Stokes : dude... duuude. awsome piece. on a visual point only, this is my favorite. My vote goes to Stokes simply because I feel it is the best painting. It's probably not as ruined as it could be, looking more vacant and old than ruined, but as far as 'concept art' goes it's got some great arch and industrial design and the central ship arrests your attention so well, I just can't go past it. "If a man be gracious and courteous to strangers, it shows he is a citizen of the world." Oooo, and my vote makes it a tie. Mine was for Stokes the most atmospheric image. I love the framing and the contrast, the shadows and the well realised futuristic setting. The human figure is a good addition too, gives a good sense of scale. Hideyoshiwas of course the close second. Plent of action and such a great depth of field. The ship in the foreground is really nice too. stokes that one turned out rad! good job bud. EtaCarinae- very cool look man. C.O.W. #168 Freestyle Creature Round -- Voting! 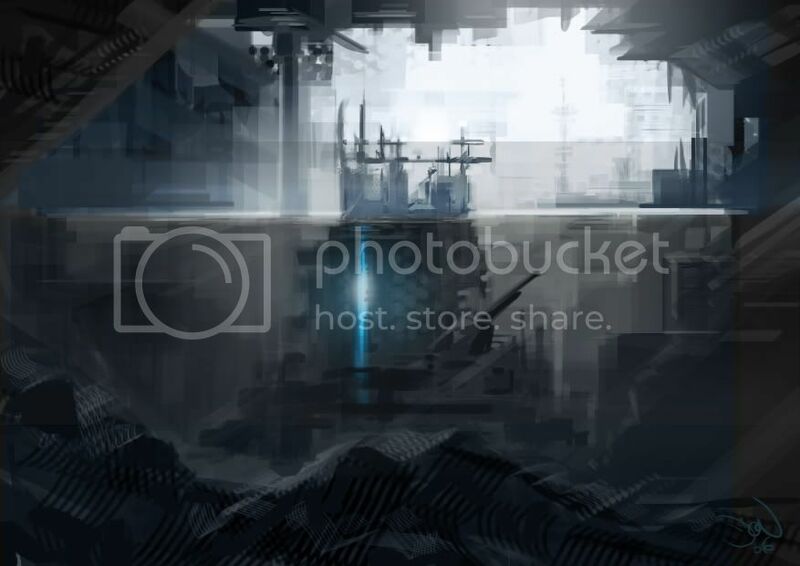 Ruined Shipyard, an old EOW that [DOESN'T need help anymore till I'm freakin done:)]!